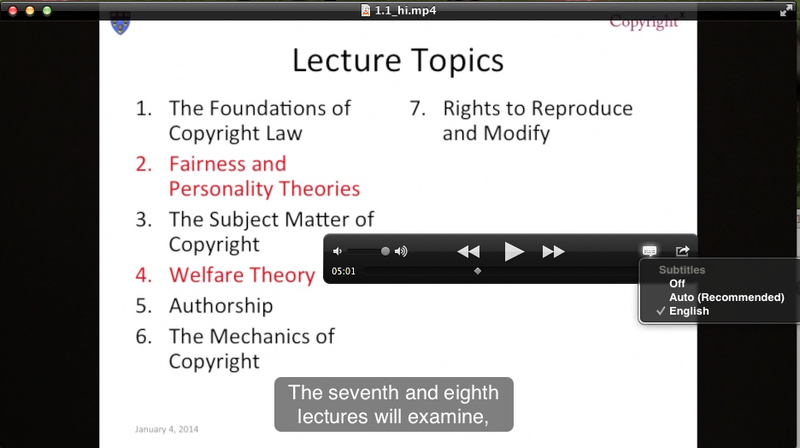 These twelve lectures were prepared and delivered by Prof. William Fisher. The original versions were recorded during the Winter of 2013. Six have since then been substantially revised. All of the lectures are licensed under a Creative Commons License, the terms of which are available on the Permission page. Some suggestions concerning the alternative ways of gaining access to and viewing them are set forth at the bottom of this page. 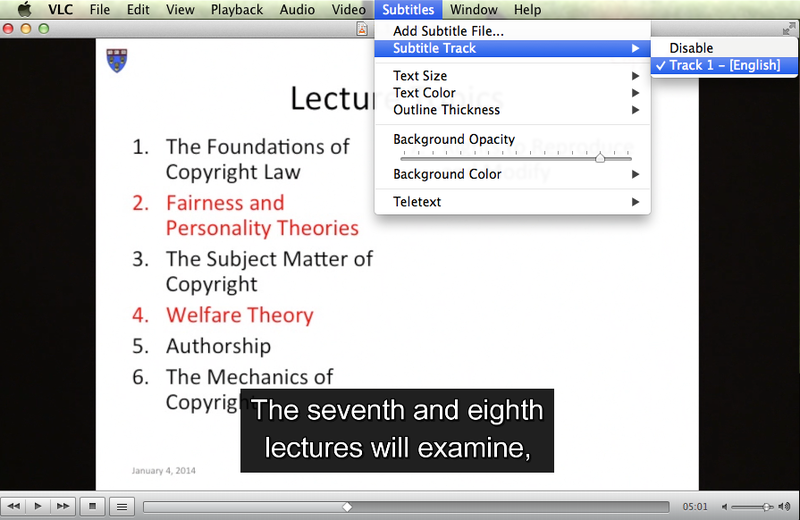 The “closed caption” feature enables you to see a transcript of a lecture while the video plays on your screen. To activate (or disable) this feature, click the “cc” icon in the bottom-right corner of the video player. <The high-resolution video files range in size from 0.5 GB (500 megabytes) to almost 1.5 GB. Make sure you have enough storage space for the files before downloading them. The easiest way to watch a video once you have downloaded it is to employ the media player that accompanies your operating system. If you use Windows, that will be the . If you have an Apple computer and thus use the OS X operating system, the default player is Quicktime. A more flexible media player, which works on multiple platforms, is VLC. You can download it for free fromhttp://www.videolan.org. One of the advantages of VLC is that it enables you to vary the speed with which videos are played. To activate this feature, select “Playback Speed” in the “Playback” menu in the VLC toolbar. If you wish to make VLC the default video player on your computer, instructions can be found at these sites: Mac and Windows. To turn the closed caption feature on and off within VLC, go to “Subtitles” in the menu bar, and then “Subtitle track” in the drop-down menu. (See this image for illustration.) To do so within Quicktime, click on the speech bubble icon that appears in the black dashboard that appears within the application’s display. (See this image for illustration.) To use the closed caption feature within Windows Media Player, you can refer to these instructions from the Windows website.